learning a new language. I took some in school - Latin (talk about aging myself), French, and German, but never really got to the point where I could have conversations. Mainly because all of the Latin speakers have been dead for centuries and France,Quebec,Germany aren't exactly right around the corner for practicing opportunities. Plus, I'm going to spend some time this winter right outside of Guadalajara. AND, the most important part, I found a retired Spanish teacher to instruct me. I've had five lessons so far. And is it hard! One hour with her and my brain is about to burst. Every time she addresses/questions me in Spanish, my mind goes completely blank. The brain cells I use for writing books is not helping me here. They must be in a different compartment. This one is all rusty. Anyway, I'm going to persist. I'm not a quitter. So there. Do you speak more than one language? Or is there one you wish you spoke? Any words of encouragement? In high school Spanish, I learned that I have an easier time learning things if I can read them. Trying to remember a word in Spanish that I'd heard but not read was really tough for me. I don't know if it's that way for you or not, but knowing that helped me because I could write down the words. As a writer, you probably have a great vocabulary. 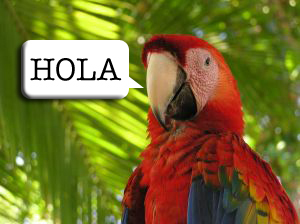 Sometimes a word in Spanish is similar enough to an English word to help remember, or the root of a word is similar. For example, Bible means the book, and a bibleoteca is a library. One thing I learned the hard way - there are a lot of words that start with 2 L's in Spanish, so my initial thought that "Oh, I'll remember it because it starts with 2 L's, and I don't have to pay too much attention to that word" was not helpful. I'm probably dating myself here, but when I took the Armed Services Vocational Aptitude Test (ASVAB) in high school, one of their recommendations based on my scores was that I become a translator. I still think whoever came up with that was not on their game that day. I can make English sit up and do tricks, but I can't even make change in Spanish. Kristina, you and I are visual learners. We have to see it to remember it. Although even then...LOL. I like your tips for remembering and will give them a try. Actually this has been a fun learning experience. Spanish has a certain musical rhythm to it. You'd have to be really good to translate, but what an unusual occupation that would be. Love your last sentence. Made me laugh. I took Spanish in High School but was not very good in it. I would like to know French as I am of all French descent. My Grandfather sent Dad and siblings to French school but they were not allowed to speak it at home. He said they were American and should speak English well but know their French too. To bad people who come to this country now don't feel the same way. The only time I heard French was when they were talking about my Christmas gift. Latin is still taught in some schools; my son took it starting in middle school. Have you tried listening to Spanish- language radio? I took French and Latin in high school. As an adult, before going to France I listened to conversation tapes and some of it actually came back! And because you learned Latin, you can figure out the root of most Spanish words. I should listen to radio. That's a great idea. I have turned on the Spanish soap operas but they are so fast. Watch Sesame Street in Spanish. That helps a lot. They repeat words, etc over and over and have simplified conversations. Another thing that works very well is finding children's books that are in English and Spanish. And having picure dictionaries. There is the picture, there is the word in Spanish. Those are actually very easy to find. I don't know if the library near you has any Spanish/English books but there may be some good stuff in the childrens section of the nearest bookstore. Sesame Street, children's book, yes I will!!! Good luck Deb! I learned besides my own Dutch, English French and German in high school. All the books I read are in English, so that one is easy. My German has sunk away deep down, but it is still similar enough to Dutch to make myself understood in Germany. But French, that is so differeny. I do have some French blogger friends though, and it is fun trying to read their Facebook posts in French. Although I often ask for the English translation. I'm jealous, Aurian! You are my inspiration! !